Home > Categories > Clothing & Access. 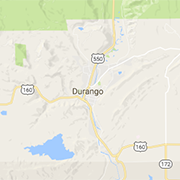 Visit some of Durango's finest clothing shops, shoe stores, trendy boutiques, and jewelers. Shop for gifts and accessories for friends and families or find a new outfit for yourself! In Historic Downtown, Animas Trading Co. has been providing affordable Bohemian style for 25 years selling clothing, jewelry, and gifts "For the Free Spirit in You!" Brown's Shoe Fit Company has been Durango's leading provider of quality footwear since 1977, & we're proud to offer the highest quality products with a friendly smile. Brown's Sport Shoe. Durango, Colorado. Gait analysis specialist & high-tech customized care. Providing built-in comfort and safety for all your outdoors sports enjoyment. Whether you’re looking for a singing bowl to meditate with, or authentic Himalayan clothing, Dreams of Tibet has something for you brought directly from Nepal to Durango. Durango's first consignment shop specializing in quality, used outdoor gear and apparel. As Durango’s only boutique eyewear shop, Eye.D’s ambition to fit you with glasses that help you look and see your best is unmatched. The Four corners' premier source for the best climbing, camping, skiing and hiking brands in the industry since 1976.